HEY THERE! Long time, with no updates getting written here? Sheesh*. But it’s high darn time I say something about Grand Prix Las Vegas, since I’ll be there in just a few days. I’m excited and stressed in equal measure because I don’t exactly know what I’ve gotten myself in for, despite generous advice and librarian-class research. I already know there’s more I should have done that’s not gonna happen before I leave town. It’s… a learning experience. Caveat: the website overall is woefully out of date. The card list is current primarily because I haven’t done new card art in years. Everything else? Hahahahaha! 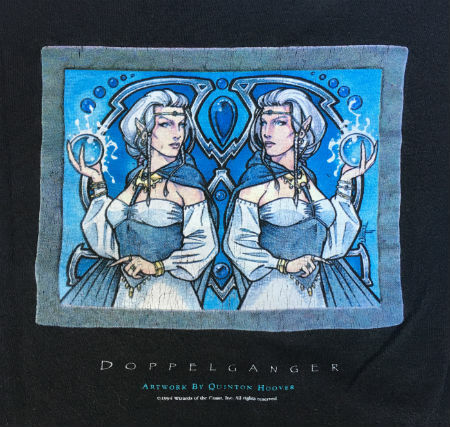 I have been working a lot, making new art and even going to shows like IlluxCon. Keeping up the website remains low on my priority list. For now, assume it’s cobwebby. Look for me beside this sign. I’ll be available for signatures, and I will do small sketches and minor card alterations. I may set up a sign-up system for sketches and alters, but I have to see how things flow. Bear with me, please. Original art. I’m driving, which makes this easier. Almost all MtG originals have been sold long since; I’ll bring what I have. 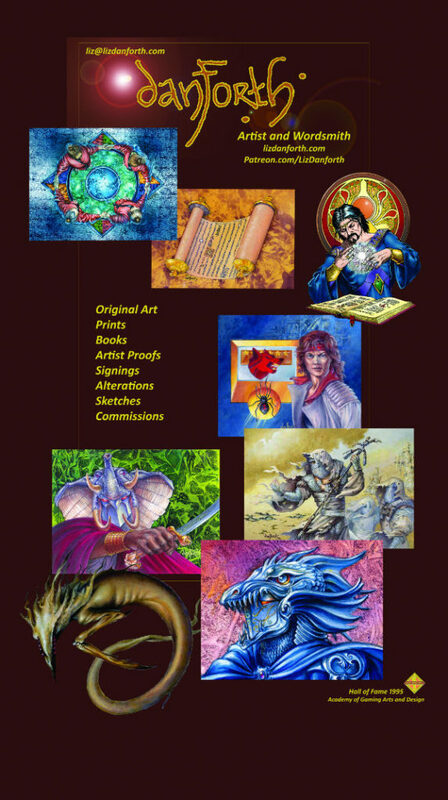 I am also bringing a selection of paintings and artwork for other games. Prints. Some Magic, some not. Some larger (full press-run print runs, signed limited edition), some postcard-sized mini-prints. 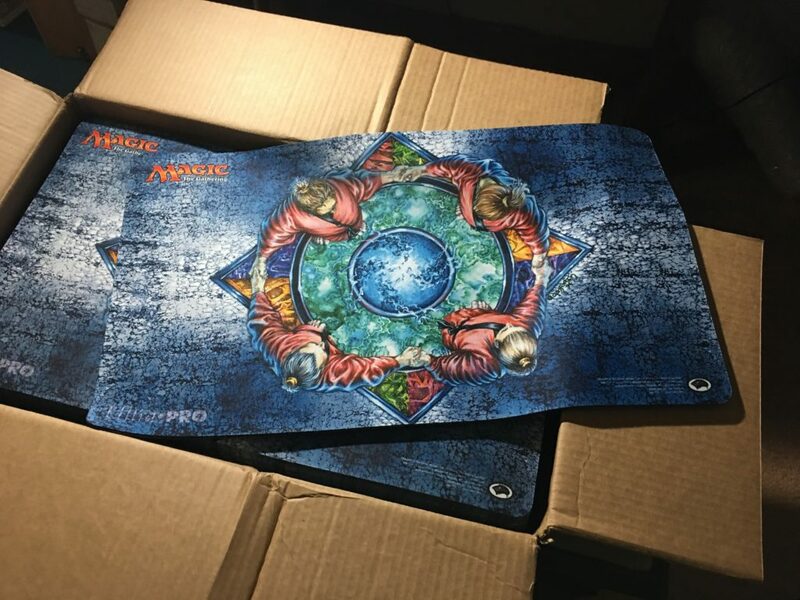 Playmats. In partnership with Joshua Krause of Original Magic Art, I will have two playmats on offer: the official Hymn to Tourach image; and a reimagined rendering of the floor visible in that card, proportioned to playmat format. Books. I have a few copies of The Gathering in hardback and soft cover. I have copies of Deluxe Tunnels & Trolls. – Hymn to Tourach wristwatch. Doesn’t work. Not sure it ever did but it’s pretty cool! – 1996 Magic the Gathering Calendar, in original wrap. Not going to be in Vegas? Have questions about this, or anything? Drop me a line! Or, y’know, say something in the comments. That works too. This entry was posted on Sunday, June 11th, 2017 at 3:09 pm	and is filed under Art, Conventions, Patreon, Site. You can follow any responses to this entry through the RSS 2.0 feed. Both comments and pings are currently closed.